At The Ceramics Studio the philosophy is to bring the centuries old craft of pottery to everyone. Pottery was one of the earliest crafts and clay is one of the most sensual, forgiving materials you can work with. It lends itself well to the beginner and perfectionist alike. This versatile making process can lead the learner to achieve all kinds of possible outcomes.We offer a wide range of services tailored for both the beginner and the professional. 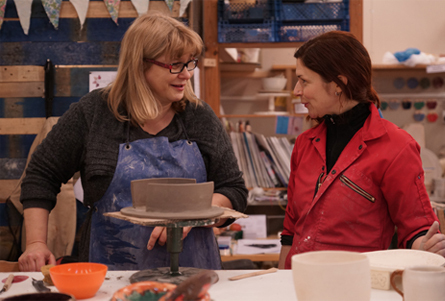 Everyone is welcome at our classes and workshops and we offer space and equipment hire for the more advanced ceramicist. With two successful ceramics businesses launched, just outside Stratford upon Avon, in addition to the Ettington Ceramics Studio country retreat, the new business, Wigwam Ceramics is really taking off. This venture allows Leyla to sell her own lively creations. Leyla believes that combining teaching and making keeps both activities fresh and interesting and provides her with the perfect balance. Leyla and Bruno met for the first time at the Earth & Fire Ceramics Festival in 2003. They were immediately drawn together by their taste and passion for honest and free ceramics. Over the years Bruno has supported Leyla’s work through the unique ‘Where I Fell in Love Gallery’, a wonderful place for a recent graduate to show next to some of the top ceramicists in Britain and Europe. In 2013, after an eight year break from making, Bruno sat down at the wheel in Leyla’s workshop and the clay called him to create again. Suddenly a quirky terracotta teapot appeared! For anyone who has tried the potter’s wheel you will know that this is quite a statement of confidence. The bare terracotta teapot needed a free and intuitive touch. Leyla had the answer – she applied colour with the spontaneous gesture that is her signature. The teapot was complete, the perfect combination of invention and freedom. They spent the afternoon creating tea bowls, bowls and many other wares. The results spoke for themselves – Wigwam was born. Wigwam is more than about making – it’s a life style. We believe in celebrating the simple things in life, creating and sharing with friends and family. An accumulation of Bruno and Leyla’s love of people, cooking and art with a touch of ‘Je ne sais quoi’, have resulted in this concept which they plan to ultimately expand in to a creative food and art retreat for everybody.